Pulses and legumes are a natural source of plant protein that are high in complex carbohydrates and fiber, and extremely low in fat. They are used extensively in Indian cooking and form an important part of a vegetarian diet. Dried legumes and pulses are classified into three groups: beans, peas and lentils. They are eaten either whole or unhulled (with the skin still intact) or split in half with or without their skins. Toor dal also known as arhar dal or split pigeon peas is one such pulse that is a pantry staple in most Indian kitchens. 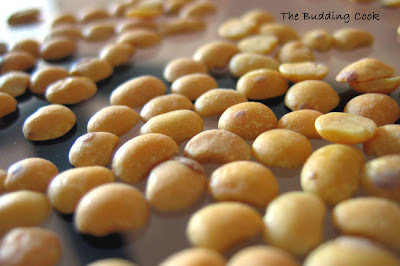 It is commonly used as the base for many of our South Indian preparations, the most common one in my home being Sambar. My pantry is well stocked with a variety of dals but toor dal is the most-used one for sure. Dal is cooked in different ways in different homes and no two dal preparations from different kitchens or even the same kitchen for that matter, taste the same. Here’s a very simple and tasty dal from my kitchen made using toor dal and fenugreek (methi) leaves. There are a number of versions of methi dal in the blogosphere. And now here’s mine! Rinse the toor dal a couple of times and then cook it in about 3 cups of water after adding turmeric powder. In a pan, heat the oil. Add all the ingredients for the seasoning. To this add the chopped onions, sauté for 2 minutes. Then add the ginger paste & mix well. Add the cubed tomatoes and cook for another 3 minutes or so. Add the cubes of frozen methi leaves to the pan (no need for prior thawing, the heat will do the job) and cook for about 5 more minutes. Add ½ tsp of chilli powder to this and mix well. When the dal is cooked, add it to the pan & bring the contents to a boil. (At this point you could add water to thin out the dal if you so desire.) Simmer on medium heat for 2-3 minutes. Serve hot with rice, pickle & pappad. 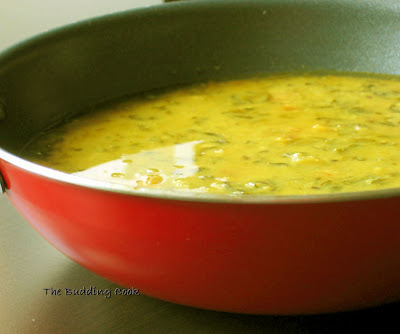 This is my entry for JFI: Toor Dal being hosted by Linda who blogs at Out Of The Garden. I am also sending this over to Easycrafts as my entry for her “Power” less cooking event. The first pic is beautiful. Mmmm! smells good, looks good, its GOOD! The first picture is enough to floor anyone :). and the second one just needs to be gulped, hogged right away! Oh Yum. This looks so yummy, and I love toor dal. I cant get fenugreek leaves, only dried ones. I don't think they would be the same. Toor daal is my favorite & it really tastes good flavored with Methi. I thought you'd gotten the post title and photo mixed up - I thought they were those vanilla sponge cookies, you know - turned out it was magnified toor dal, LOL! Nothing could beat a bowl of dal rice and lil ghee:). That's how I like to eat.... Delicious. that is a droolworthy dal. will make it soon. I love methi pappu, and that is a cool entry. Nice, simple and healthy entry buddy. I love to have this kind of dal as it is...just like a soup. I like that bowl. I love dhals!! Your Methi dhal looks yum yum.. can i have few rotis to go along please!!! TBC, the dhal looks so amazing.. I love the colours.. the green specked yellow dhal in a red bowl - perfect. Have bookmarked this methi dhal to try (hopefully soon). Nice and easy recipe... Makes a gr8 entry to two events at a time... Wonderful! Oh this looks soo good! I wish we had some of these ingredients here! nowdays cook lots of dal dishes, especially when kids started eating it..and time saving too..thanks for the recipe , TBC. Great entry for JFI. Nice pictures. Thanks for sharing. Methi dal?? That's totally new to me TBC, will give it a try! One wuick question, what do u mean by the froxen methi? I have good ol' plain methi seeds...will that do? The picture looks tempting, I will make this in this week for sure. Thanks for sharing. I too make methi dal with almost the same ingredients but little different. I will try your version too. Beautiful pics and recipe. Looks so comforting. Do let me know if you try my version. Sra - ha, ha. That has happened to me before and that had to be the only time FBD picked it up amazingly quickly! Shivapriya- The dal-rice bit sounds good. It's been ages since I had it with ghee. No rotis for u 'cos I have never made a single roti my entire life! Bharathy- thanks:)Glad u like it. Namratha- no methi seeds girl! This is the most-often-prepared dish in our home w/o methi leaves. Will try with fresh methi leaves next time. I'm happily confused about all the dal variations, but does it matter if I use dried fenugreek leaves? I have a small box of it. How much would I need? 3 tablespoons, perhaps, as a substitute for the frozen? This looks so darned good. I've never heard of fenugreel dal before. I must give it a try. totally agree with u , tbc on the presence of dal in our pantries, the snaps luk great, as usual..
Nice nice.. interesting twist on the regular dal. I have never tried it out with methi. Next time round. Also, thanks for letting me know about the JFI Toor dal event.. My entry shall be quickly sent to Linda. Hi, Saw your comment on my blog. Thanks for coming by. I happen to like methi dal, too. Actually I like methi in lots of dishes. Its a very healthy green, but perhaps not liked by too many people? How did i miss your post? Thats one simple recipe but the picture looks absolutely fantastic!!! We love dal especially when it is cooked with some greens! your's looks delish, girl. Reg commenting, please concentrate on what is important for you right now. Blogging should just be a hobby and nothing else;-)We will all be around when u return. Seec- It is so nice to see you here. Thanks for visiting some of my older posts and taking the time out to leave comments there too. You are not the only one who is confused! There are so many different lentils & each one has its own variation. I am still learning. Cynthia- Do try it...it is so simple and tasty! Aparna-thanks for stopping by. I too like methi in a few dishes. It does have a very strong taste and you are right-not everyone would like it.